Sometimes my energy goes for a walk outside in Leslieville, and occasionally gets invited inside for drinks. Here i am going inside On the Other Hand jewellery shop at 1015 Queen St E. You have to buzz and wait. They look you over and will unlock the front door if they like what they see, just like they do downtown at the fancy shops in Yorkville. The owners are halfway through painting a mural on the exterior of their abode, so today the store appears to be ‘molting’ into a colourful maturity, just like the rest of the neighbourhood. Leslieville is an area of Toronto that is emerging. When people say an area is emerging it means condos are emerging. When condos appear it means the cool artsy shops and cafes that were struggling a decade ago, and now thriving, will soon disappear. One by one they’ll be gobbled up by bigger businesses. Franchise outlets will devour the cute sandwich shops and the indy cafés will go Starbucks and On the Other Hand jewellery store will … probably survive. These gals are survivors, and what they do is very unique. On the Other Hand jewellery shop is run by two girls. Below is Karen MacRae who’s a big name Canadian jewellery designer and gemologist. She’s fun because she’s happy and she’s happy because she has a great job and super interesting life making things with her hands. She took me a behind-the-scenes tour of her craft studio, which soon after became a shopping spree in the front end of her store. Too broke to buy new bling? Can’t afford hand-crafted keepsakes made from gold, silver and Mexican wood? Me neither, so I was thrilled to be bribed. It was a bribe the scribe scenario. The goods are certainly not free to me, as you understand reading this artful text that took so much time to compose. 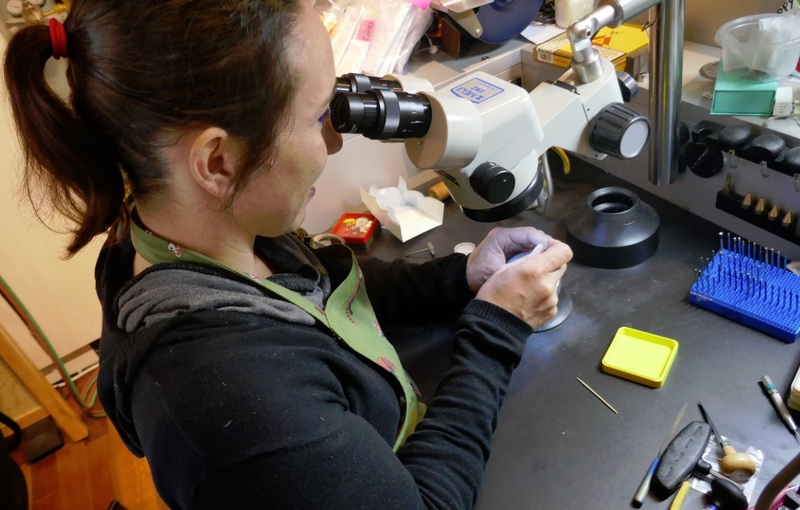 While Karen tends toward traditional fine gold and silver and she uses the best diamonds and gemstones to make superb World class custom engagement rings, Sabrina likes to ‘break the mold’ and use more unconventional materials – like wood. 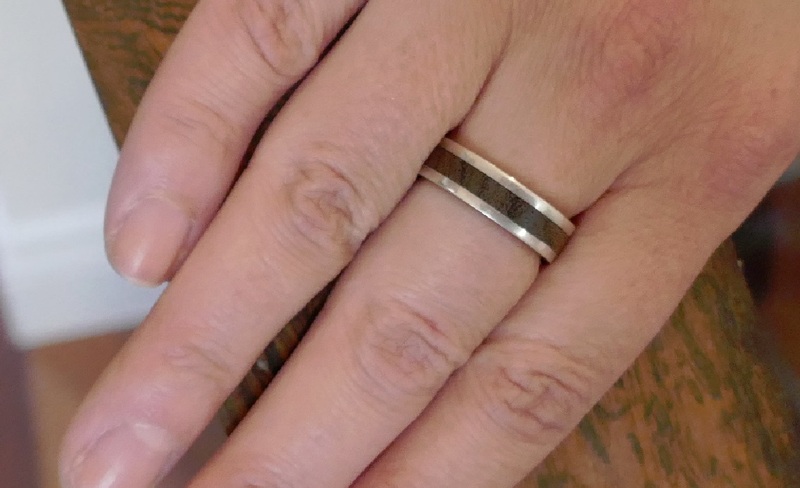 Above is silver ring with a Bocote wood insert. Each piece is beautifully unique, with striking patterns of swirling grain. Native to Mexico, Central and South America, this wood is also used to fabricate musical instruments and gun stocks. Sabrina just wrote about breaking tradition by using unconventional materials to make jewellery on the OTOH blog. I had an idea for a TV show – Is this the End of the World? Thirteen scenarios. Every episode would be a meltdown of some kind. Start with Trump in Episode One – a deranged US president makes an apocalypse to get re elected. Second episode – environmental disaster – Trump again. Third episode, economic meltdown. That episode follows Trump’s America First economic action plan to its logical conclusion – class warfare. Is this the End of the World? series would have Metallica ‘Four Horsemen’, as theme song. That’s whats this ring is about. Its one of the first things that caught my eye when i went inside the jewellery studio in the back of the shop. Its a ring for the end-of-the-world. 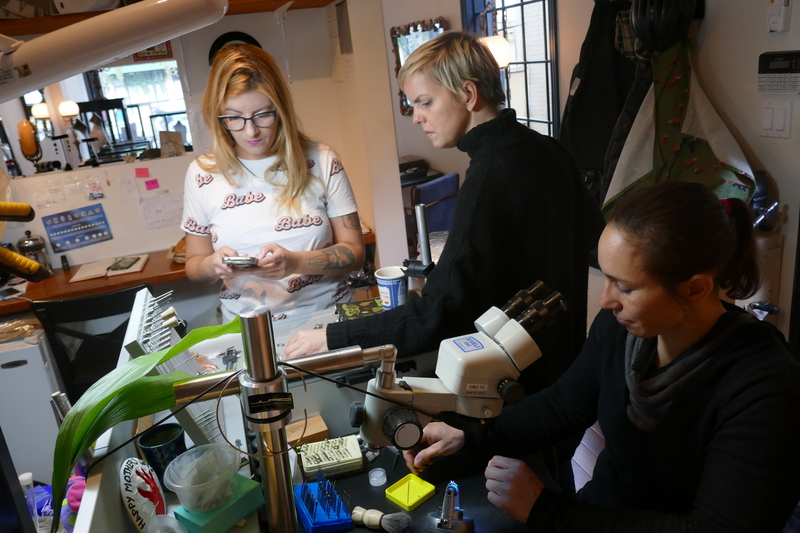 Sabrina Melendez is a Swiss trained and certified goldsmith. Together with Karen they’re a team and a couple of kindred spirits who frequently collaborate. They’re inherently happier than the rest of us because they have fun and interesting lives and as such they seldom argue with each other. Its easy to get giggling and have a blast with people who are happy. Sabrina took a break to give me one of her necklaces, a silver Slinky-like band on a black leather cord. It has a great weight and sophistication. It has a subtle charm. I love it. …usually when I make a piece of jewellery it’s around a pretty stone. That’s my starting point. The point of the exercise with those necklaces was to use metal pieces that I had available for something cool. So I had this silver metal tube available. (making tube is a labor intensive process). The tube sat at my bench for months before I decided to make some really simple necklaces with them. I also had this beautiful Japanese cord ( the necklace part) It’s made in Japan, it’s great quality and the cord has this sort of shimmer to it, you can tell it’s well made. So I decided to put these 2 simple elements together, the cord and the silver tube, and one shows off the other I think. 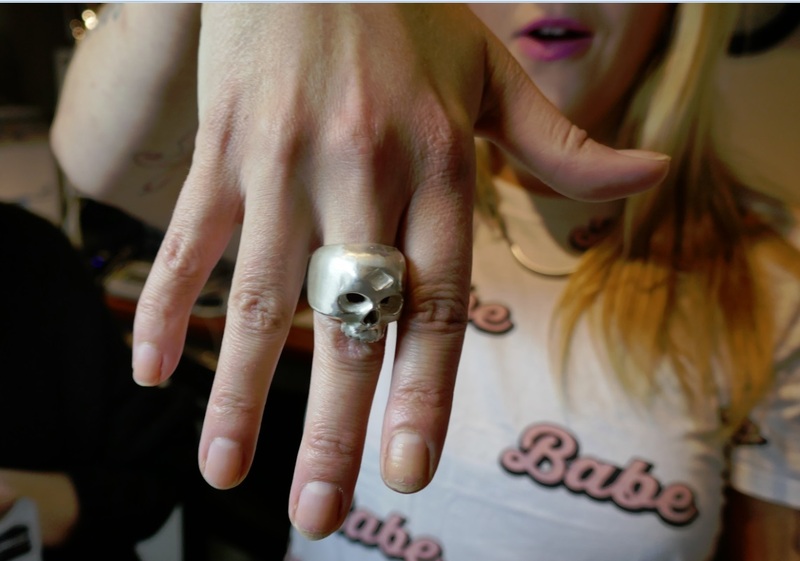 What’s so cool about On The Other Hand jewellery is that anything is possible. If you have an idea or some materials and a sketch these gals can breath it into life. 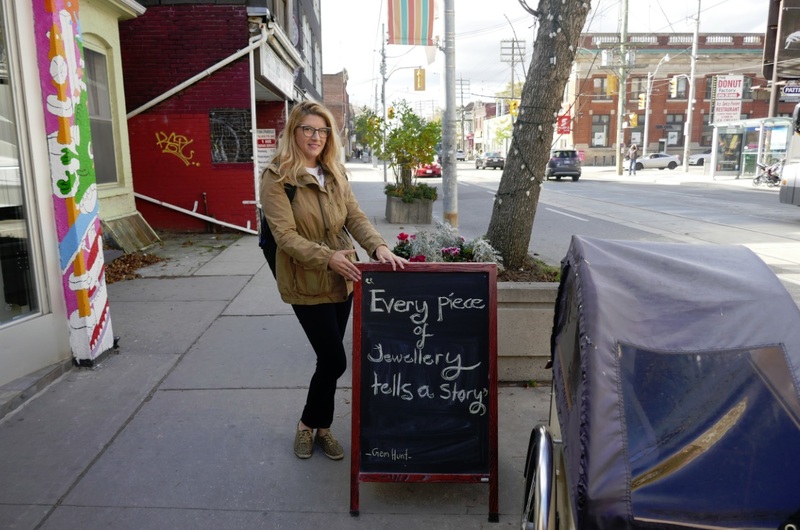 On the Other Hand jewellery makes luxury in Leslieville.